About two years ago while taking a course in Kinesiology of Aging at SFU I was aware of challenges I was facing as an older student. The course was particularly difficult and my visual recall was poor and not working the way it did in my 20’s. I was reading everything three times to develop a solid memory of the content. I was also reading about how researchers can now identify biomarkers 20 years in advance that can predict to some degree the onset of these conditions. It was a challenging time as I wrestled with my brain, the course content, and the realization that I might be a candidate for mild cognitive impairment sometime in the future. When my courses completed a year later it was time to launch myself into a rewarding career. I was looking forward to finding work that would challenge me in a variety of ways and yet at the same time I felt tired, lethargic, and more like a wet rag. With two kids in their late teens, I had spent twenty years of life raising kids and sacrificing myself for family. I had suffered from a lot of stress over those years and often felt low, irritable, scattered and anxious. I needed to figure out a way to have more energy, be a lot more efficient and productive, and to find a way to feel optimistic, passionate, and more driven. So in January of this year, 2014, I set out to overhaul my body, mind and spirit. I went to the gym, took an intensive yoga program for 7 weeks, and began with sessions of hypnotherapy, and finally neurofeedback. I began a period whereupon each week I noticed persuasive changes in my visual recall, self-organization, optimism, and resilience. It has been an exciting time and each week I feel better and better. I am no longer overwhelmed by everything that happens in my daily life and I am able to remain centered and focused on the goals I have begun to lay out for myself. Though I have had doubts at times (as the changes have been subtle) I can say reliably that I have had consistent improvements over the 10 sessions achieved to date. I feel that my dreams are more attainable and I am excited by the results. I am a professional realtor with over 25 years in my business and have taken many courses and programs over the years. Neurofeedback is one of the most impactful things I have done. It has enabled me to be more productive at work, more focused and creative, helped me to connect with my staff more, and my company is running smoother than before I started with these sessions. I listen and collaborate better and I am more relaxed and peaceful. The Neurofeedback sessions have also positively affected my personal life. I feel closer to my family and all of the other relationships in my life have improved. I am also sleeping better and more resilient and not rattled by anything. I would definitely encourage people to do Neurofeedback and to take as many sessions as needed to reach their goals. I began my neurofeedback sessions with Nicklas just over a year ago, motivated primarily by the goals of achieving greater energy, focus and creativity. While it remains an ongoing process to continue optimizing these characteristics, they’ve definitely improved … but I’m most impressed by the changes that have occurred in areas that weren’t top-of-mind when I started out. I’d not, for instance, really given much thought to the notion of my own resilience. I suppose I knew that my stress management skills needed some enhancement, but hey, the anti-depressants I’d been taking for 15+ years took care of that well enough. Several months in, I found that the neurofeedback sessions were giving me such a palpable emotional boost that I decided to taper down to a lower dose of antidepressants. That went so well that I eventually tapered down to nothing and have been medication-free for four months. And now? I still get blue. I still get anxious. I still get irritable. Stress still unsettles me. However, none of these doses of life’s realities takes me down any more, not for any length of time. I’ve learned to take better care of myself. I’ve learned to recognize and meet my own needs, and to distinguish “need” from “want”. I’ve learned to “choose my battles” and emerge stronger for the next round. I have, in other words, developed resilience … and what a useful muscle it is! Further unexpected benefits: self forgiveness and acceptance, improved communication, increased comfort in social situations, greater empathy, renewed optimism, a sense of peace within myself … one that isn’t nearly as tenuous as it used to be.Thank you Nicklas, for your compassion, your skill, and your continued support in my efforts to be the best me that I can be. Since first visiting Nicklas over 6 months ago I have noticed a couple of overall improvements in my life. I have found myself to be more able to stay focused in my business, keeping sight of the bigger picture and not getting so bogged down on multitudes of detail and secondary tasks. My public speaking confidence has improved noticeably. The ‘idea’ of speaking in public has always appealed to me, but putting into practice has been a bit of a terror. Now I seem to be more conscious of what my body is going through and somehow am able to stay more relaxed. Finally, my short-term memory has really improved lately. I can still misplace my keys, but more often than not I now remember exactly where I set things down – usually my keys and glasses, and usually in the morning when I’m in a bit of a hurry. I have used Neurofeedback for a few months now and looking back, can see clearly how it steadily improved the resiliency of my brain and body. Although I have a busy lifestyle, with a few areas to juggle, Neurofeedback continues to help me in keeping these areas separate while I attend to each one 100%. I see benefits in my personal life as well as in my life at work. My spouse and I share enhanced connection and communication, I am successfully building a private practice and my friends positively comment on the subtle changes. The great part about Neurofeedback is that these changes are solid. At this point I use the sessions periodically as maintenance, having seen proof of how, through cellular memory, my overall health status and wellbeing have improved. Leaving Neurofeedback sessions, I’ve felt energized and inspired to work on my goals and sort through challenges I began exploring at that time. I highly recommend combining the Neurofeedback with Nicklas’ counseling sessions – together they have helped me gain objectivity and confidence around my career and personal life. The greatest change I have noticed since starting the neurofeedback sessions is much more emotional balance. I used to feel emotions at an extreme to the point where I was almost paralyzed by them or stuck in them so deeply that they consumed me and made it difficult for me to focus on daily living. I have noticed that I have greater confidence in myself and less anxiety about the past or future. I seem much more able to complete tasks without having anxiety or stress and do not seem to get overwhelmed when I have a number of tasks that I have to complete or obligations that I need to attend to. In this regard, I have also learned to say no and to understand more about healthy balance when it comes to taking on projects or commitment. I am much more able to live in the present and focus on the now rather than worrying about the multitude of things that may happen in the future. I seem to have a clearer instinct when I have decisions to make – and seem to be able to be clear about choices far sooner and with less anxiety than in the past. My general outlook is positive now and I feel I have greater gratitude, joy, positive outlook and excitement about life. I am much less reactive to people and situations and my relationships have improved greatly because of this. I have learned to set healthy boundaries without guilt and have navigated myself towards healthier, positive relationships while shedding negative or toxic relationships. My whole life I was a prisoner of my fear, without even realizing it. I was afraid to make a mistake and then to be punished for it. Neurofeedback really changed me. I became aware of my fear and my brain learned how to approach it. I sometimes have the same panic reaction at first, but now I immediately become aware of my reactions, and thus become aware that it’s only in my head and not a reality, and that I have options to react differently. I am calmer, think more freely and am able to search for positive aspects of situations in my everyday life. During the session you don’t have to do anything but relax and even sleep if you wish to. You wake up and you are changed for the better. This is fantastic. 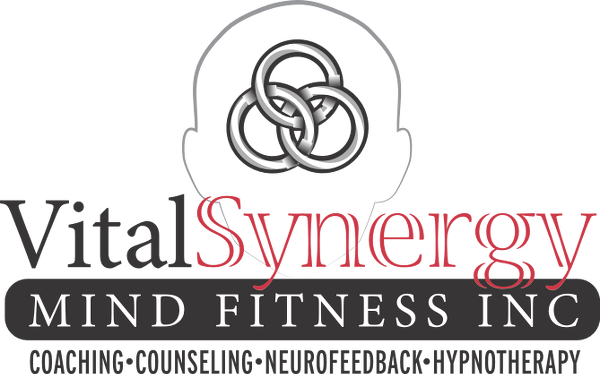 I strongly recommend VitalSynergy and Neurofeedback. I was receiving counseling services from Nicklas for a six-month period in 2012. Initially, I was seeking guidance from Nicklas for challenges in my marriage but soon realized that her advice helped in other personal and business relationships and situations. I also received Neurofeedback, which enhanced the counseling and was extremely helpful in bringing out positive thoughts and being able to have clearer thoughts and prioritizing more effectively. I found that I had more energy and it brought out more creative elements in my life with my hobbies and interests. It also helped my memory and decision making abilities. I have known Nicklas for over five years now, and she has been a blessing in my life helping me with numerous mental barriers that I’ve had to overcome. Last summer she introduced me to Neurofeedback and it helped me in many facets of my life. She helped me with top-notch professionalism and was someone that I could count on in discussing my daily affairs. The Neurofeedback shed new enlightenment on my mental faculties, and I would recommend anyone that is struggling with anything neurological and emotional to give Nicklas a chance to assist them.